For once we were having a summer where sunshine was in endless supply, with weather forecasts presenting rain-drop free images for the days ahead… that was until the week running up to WOMAD! Suddenly unpredictable skies loomed beneath the relevant dates. Grrr! So when packing to take my nieces (aged 9 & 11) for their first ever festival experience, I prepared for all eventualities. Wellies, brollies & sunnies… the perfect ‘fest kit’. Thankfully ‘day one’ remained rain free, despite a few threatening clouds. Family camping was in an ideal location. We nested ourselves in an easy-to-find spot just aside one of the boulevards which linked to the toilets (necessity #1), nearby a tap (necessity #2) and a mere ‘hop, skip & jump’ from the entrance – ensuring limited lugging (necessity #3). With those essentials ticked off, beautifying our abode with flowers was our next task… great for identifying our tent in amongst the sea of green canvas! Set up and raring to go, we hot-footed with the hoards into the main field to be welcomed by colourful flags, a patchwork of stalls, stages full of promise, gigantic music tents and a vintage steam fair fit for ‘boho’ royalty. The girls’ eyes widened as they absorbed the visual feast, whilst I wondered how shuteye would fit into the whole equation! Music kicked off in style on that Thursday evening, with Italy’s L’Orchestre di Piazza Vittorio enticing us into the Big Red Tent – a wild multi-ethnic mix uniquely interpreting Amadeus’s ‘The Magic Flute’. This extravagant and showy performance blended tabla, djembes and rock guitars along with a whole plethora of orchestral instruments. Buoyant with excitement, we bounced around the site to get our bearings and soaked up the already buzzing atmosphere. Friday blessed us with high temperatures and clear blue skies. Ice-cream vans did great trade, the tree-shaded ‘World of Wellness’ offered welcome respite with a gentle vibe and the ‘World of Kids’ had the girls embroiled in fun activities. 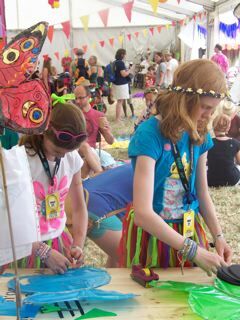 Colourful tutus and ‘grass’ bracelets were soon created whilst drumming and circus workshops were celebrated… they were in festie heaven! Our evening offered up a melting pot of music and fairground rides. After discovering first hand that some rides were scarier than others, we did a group huddle and agreed to opt for the more gentle options. The ‘Wall of Death‘ show received rave reviews from friends, but we didn’t get to see the motorcyclists in action as headphones were essential for protecting my youngest niece’s sensitive hearing. Headphones will definitely be packed next year as they are a handy accessory for younger children. Saturday morning the girls were booked into one of the many creative workshops – ours was for making beautiful butterflies to carry in the Sunday evening’s procession. With the metamorphosis of their masterpieces complete, we stepped backstage to catch up with a few artists and find out what inspired them… what else would the editor of Inspired Times ask? Canterbury’s The Syd Arthur band were friendly as well as talented, and they happily signed my nieces’ autograph books (a few brownie points were gained for that one!). Raven Bush, keyboard/violin player, told me that the diversity of life inspired him. 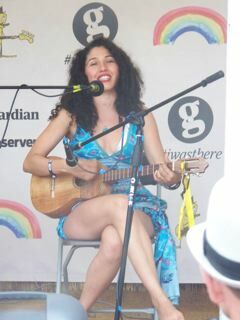 We agreed that WOMAD displayed the magnitude of diversity magnificently! Family Atlantica‘s vivacious lead singer, Luzmira Zerpa, cited ‘love’ as her inspiration… the kind that smacks youdeep in your core when something feels right. As she passionately uttered these words the heavens opened and lovingly poured rain down… continuously until the early hours of the next morning. Festie spirit reigned strong and we weren’t to be deterred! Returning front of stage, David Wax Museum from Stateside, was up next. Their cool ‘Mexicana’ sound captured our attention before we ducked inside a cosy cafe for some tasty pizza. Dodging the wall of rain, we then pitched up in front of the Siam tent’s stage to experience headliner’s Babylon Circus at full blast. They lifted the roof with their French ska, oozing ‘Gallic cool’. These pros worked the crowd – instantly everyone became all fired up and shouting for more. My eldest niece announced after that they were “a bit too crazy” for her, but I’m pretty sure at some point in the future she’ll be skanking with the best of them. Sunday remained dry for the majority of the day, bar a downpour during the kid’s procession – but fortunately their beautiful face paintings remained drip-free. More amazing music graced the stage in the shape of Gocoo – a Japanese taiko drum ensemble who danced with the energy of warriors heading into battle. 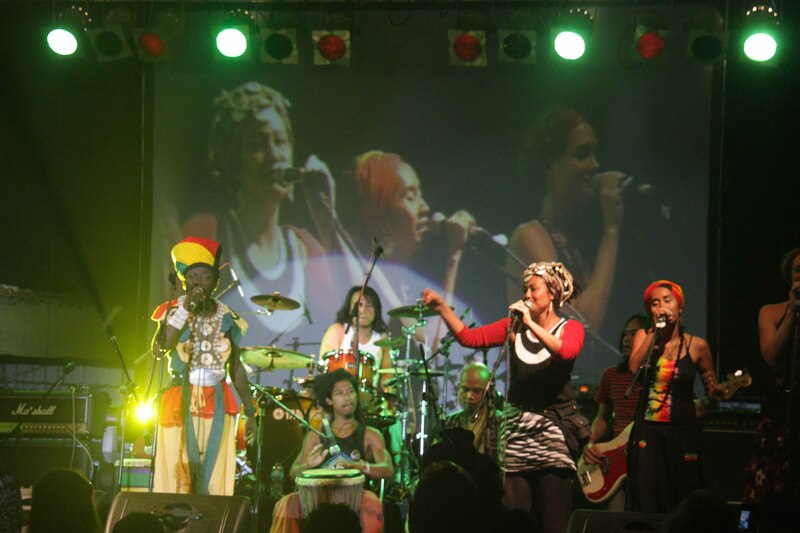 The beats were tribal and the women fearsome! 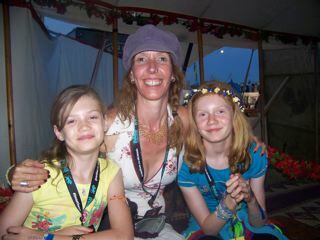 We finally left on Sunday evening, the girls donning hair wraps, henna tatoos, face paintings and soggy socks. WOMAD had been an incredible first festival for them – one I hope exposed them to our eclectic world’s vast array of colourful diversity and talent. As we pulled away I asked if they wished to try a different festival next year, or preferred to return… the response was unanimous. WOMAD 2014… it seems we’ve got a date in the wilds of Wiltshire’s fields! 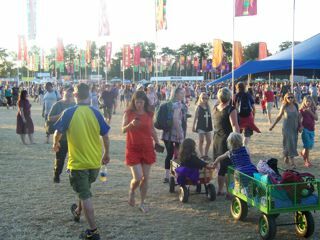 The wonderful fields of WOMAD!